Staying on top of security for a campus with a couple dozen buildings and cameras can be a busy job. What about one with 124 buildings and more than 1,000 cameras? 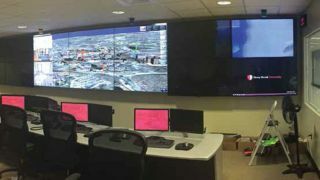 Stony Brook’s situation room features 14 commercial displays from NEC and LG, with the center 2-by-3 grid displaying the Hiperwall visualization solution. That was the challenge for Massapequa, NY-based integrator IntraLogic Solutions (ILS) when it was tasked with consolidating the security infrastructure at the State University of New York at Stony Brook (also known as Stony Brook University) into an intuitive, responsive control room capable of alerting administrators at a moment’s notice in the event of any kind of emergency. In addition to the tremendous amount of camera feeds from hallways, entrance and exit points, and gathering places around the 1,039-acre Long Island campus, the university also needed a central way of monitoring alerts from the many other alarm systems throughout. For Mandel, the solution was simple: A visualization system from Hiperwall, a hardware-agnostic, software-based video wall system, which ILS had been utilizing for several years for clients, including large government agencies. One of the key advantages of the Hiperwall system, according to Mandel, is its flexibility. “We’re taking any video source—any sort of video feed—and we’re pushing it to any location that we want, whether it be in the situation room that we built for Stony Brook, or out to someone’s phone, or computer, or remote location,” he said. For the control room, or “situation room,” as Mandel called it, ILS installed a solution based on displays from LG and NEC. In the center is a 3-by-2 video wall comprised of 55-inch NEC no-bezel displays to display the Hiperwall mapping solution, surrounded by eight LG commercial-style TVs that provide extra data and television streams. In addition to ease of use, another key advantage of the Hiperwall solution is its adaptability: Since it’s a purely software-based solution, as technology advances down the road, Stony Brook can upgrade the situation room’s computers and software without compromising the system. Matt Pruznick is senior editor for Systems Contractor News and Residential Systems. Follow him on Twitter @Pruznick.